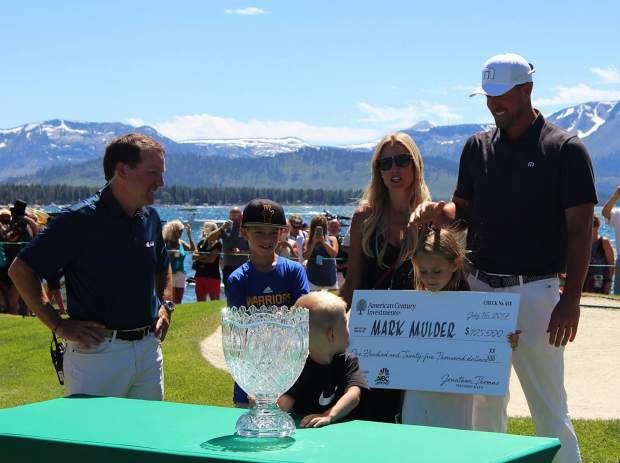 Mark Mulder made history Sunday, July 16, becoming the first player to win three straight American Century Championships. Another record was the attendance. Tournament officials announced a crowd of 55,801, an increase of 16 percent from last year’s then-record mark. “Well, it was something that I knew coming into this, “ he said. “I knew nobody had won it three times. And, records are made to be broken. It’s cliché, but it’s the way it is, and I was very confident. A momentum changer for Mulder came on the par-5 4th. Mulder had started with two pars and a birdie to get to 53 points, three ahead of Lowe and six ahead of Fish. “I had a 7-iron into the green,” Mulder said. “I was playing for a flyer lie, and I didn’t get it. It plugged in the bunker. I had a fried egg. I looked at my buddy, going ‘all right Kenny, let’s just make five’. “I walked off the green saying that was one of the best plays that’s ever happened,” Mulder said. Lowe, who had three birdies on the front nine, was tied with Mulder heading into the final nine holes after rolling in birdies on holes six and seven. Fish’s problems started on the par-5, third hole. “I played the first two holes well, “ Fish said. “I hit my best drive of the day on 3 and hit a great 3-iron kind of pin high. I just misjudged the greens all week like I did last year. “I remember last year I had 11, three-putts. It’s really pretty much a constant thing right now. You are right, that No. 3 was really a tough pill to swallow. I couldn’t get out of the funk for a few holes. That four-putt bothered Fish on the par-3, fifth. He was about 15 feet way, and sailed the birdie putt 10 feet past the hole. He missed the comeback putt and settled for a bogey, losing another potential point. Fish never got on track enough to put any pressure on Mulder, but he was able to catch the faltering Lowe.